The Shiva Trilogy, written by Amish, is a fictional tale of a Tibetan tribal called Shiva, whose adventures nearly 4000 years ago, morphed into the mythical legends of the Hindu God Shiva. 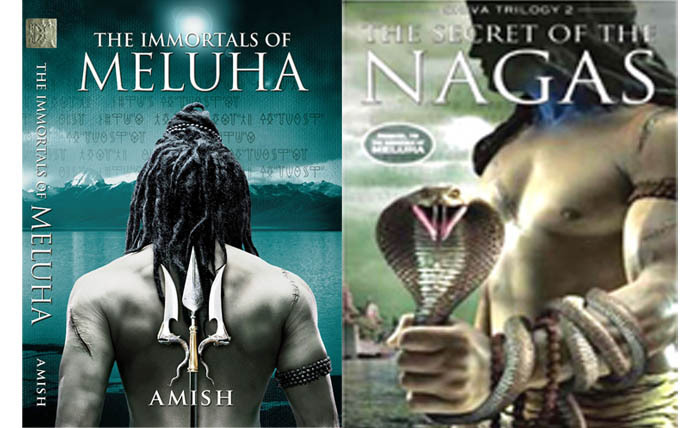 The Shiva Trilogy (The Immortals of Meluha, The Secret of the Nagas and The Oath of the Vayuputras) has more than 2 million copies in print with gross retail sales of over Rs 50 crores, making it the fastest selling book series in the history of Indian publishing. Over the last few months, The Oath of the Vayuputras, The Immortals of Meluha and The Secret of the Nagas have remained at the top in the A C Nielsen bestseller list in India, one of the rare occasions where one author’s books dominate the national bestseller lists so completely! Published by Westland Ltd, the books have been released across the Indian subcontinent in various languages, including English, Hindi, Marathi, Gujarati, Telugu, Bengali, Assamese. It has also been released in the Indonesian language, Bahasa Indonesia. They will also be released very soon in other languages like Tamil. Additionally, Jo Fletcher Books (an imprint of Quercus Books) have bought the English language rights outside of the Indian sub-continent and has published the first book, The Immortals of Meluha, in the UK in January 2013. The book will be released in the US in Summer 2014. The book is also due for release in Vietnam soon. The Shiva Trilogy has attracted a wide and devoted audience since its publication, with publishing gurus calling it a genre-creating book series. It has also received positive reviews from various eminent personalities. Spiritual guru, Deepak Chopra, complimented the books saying, ‘Amish’s mythical imagination mines the past and taps into the possibilities of the future. His book series, archetypal and stirring, unfold the deepest recesses of the soul as well as our collective consciousness.’ Renowned Film Director, Shekhar Kapur, called Amish ‘India’s first literary popstar’, while celebrated author Anil Dharker called him ‘a literary phenomenon’. Many marketing innovations have also been attempted for the Shiva Trilogy. For the 1st book, The Immortals of Meluha, the first chapter had been printed and distributed, free of cost, as a sampler. A trailer film had also been made and uploaded on YouTube, probably for the first time in the history of Indian publishing. For the 2nd book, The Secret of the Nagas, a professional film-quality trailer film had been made and showcased in cinemas, once again for the first time in Indian publishing history. The string of innovations has continued in the marketing of the 3rd book of the trilogy, The Oath of the Vayuputras. For the first time in Indian publishing, an original soundtrack album has been created for a book series called ‘Vayuputras: the soundtrack of the Shiva Trilogy books’. Giving the life of music to the soul of the words, all the 10 songs in the album have been originally created out of various sections of the 3 books of the Shiva Trilogy. Top-notch musical artistes like Taufiq Qureshi, Sonu Nigam, Palash Sen & Bickram Ghosh have contributed their talent to this album. A professional, world-class music video has also been produced which is being telecast in various music channels.